Ram thank u so much for arranging every thing for the trek, u have an excellent team of guides , they were so professional , humble and honest team. i can never forget the trek, and wish to have some more in different parts of nepal. wish u all the best n happy new year 2017. 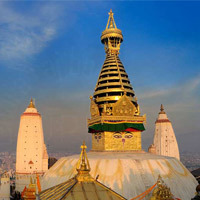 When we landed at Kathmandu, we were curious to see the monuments of this city. We discussed with our operator Lovely Nepal Tours company and they organized a private day tour to explore the UNESCO listed sites. We visited the Hindu temple Pashupatinath and Boudhanath Stupa. My wife Nancy surprised to see the dead body burning on the bank of the River. The shrines are superb. The pagoda style temple has inscribed different wooden artefacts. The stupa is equally charming with the peaceful Buddha eyes. We are thankful for the amazing trip.